This explored our journey through the integration of technology into retail financial services. Many aspects of our lives are being changed, usually positively, by technological innovation, although on some occasions the transition from old to new can be frustrating. Therefore, it is not surprising to see more fund managers focusing on sustainable investment, and for many this is welcome news. Mainstream investment has been dominated by equity and bond markets, generally with little regard to sustainability, but that is changing. Having recently attended a presentation by a fund manager on the topic, it is of note how far some investment houses have come, their improved propositions, and the potentially unlimited journey ahead. 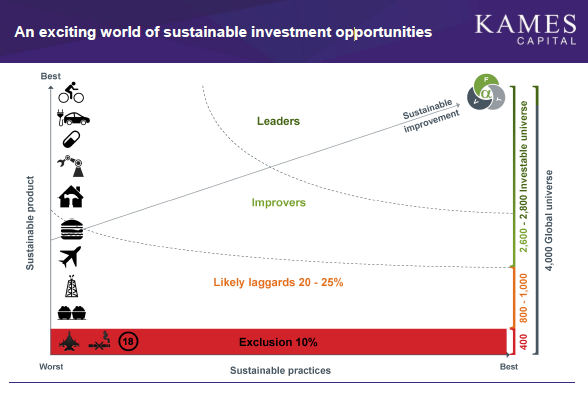 For information (example only and there are a good few others available) the presentation was from Craig Bonthron who co-manages the Kames Global Sustainable Equity fund. His notes mention the managers' desire to search for companies within the fund's investment mandate which are "Leaders" and "Improvers" in the ESG space. 'ESG' refers to the three core factors in assessing the sustainability and potential impact of an investment in a particular company: environmental, social and governance. When investing into pensions and investments, as examples, Chapters Financial will discuss with you your attitude and capacity for investment risk. However, it is also important to understand additional criteria that you might want to apply to all or part of the funds that you invest into, such as your ethical stance, ecological stance and views on sustainability. Each is important to creating the right solution for your needs and the team look forward to helping you with these. Client views and needs also change over time and with circumstances. This is nothing new, therefore keeping your plans and arrangements reviewed regularly is important. No individual advice is provided during the course of this blog and nor is there any intention to promote any specific investment fund.